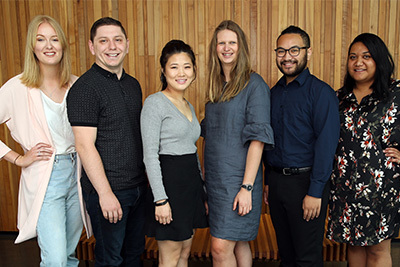 Our Oceanian Leadership Network is an inclusive interconnected group of students from different faculties, schools and campuses across the university. The network is driven by students who are passionate about educational achievement, and focuses on students developing their own successes through leadership and service to others. We have over 200 navigators (student mentors) from across all faculties, schools and campuses of the university. They are there to guide and grow our students throughout their journey at AUT. The term takes inspiration from our ancestry of voyagers and seafarers who used star constellations to navigate their wakas to new opportunities. Oceania represents the Pacific Ocean and all islands, atolls and archipelagos that it holds, including New Zealand. Oceania is great and expansive, like the Pacific ocean: rich in marine resources, cultures and people unhindered by boundaries. The world of Oceania is not small; it is huge and growing bigger every day." "The issue of what or who is a Pacific Islander would not arise if we considered Oceania as comprising human beings with a common heritage and commitment, rather than as members of diverse nationalities and races. Oceania refers to a world of people connected to each other...As far as I am concerned, anyone who has lived in our region and is committed to Oceania is an Oceanian. "We have to search for common identities that are more accommodating, inclusive, and flexible. "As the sea is an open and ever-flowing reality, so should our oceanic identity transcend all forms of insularity, to become one that is openly searching, inventive and welcoming."